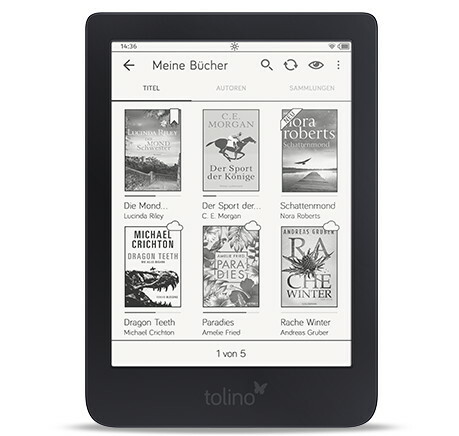 Yesterday the Tolino Alliance released a new 6-inch ebook reader in parts of Europe called the Tolino Shine 3, and it just happens to look exactly like the Kobo Clara HD. Not only that but it has the same exact specs as the Clara HD, with 8GB of storage space, a 1GHz processor, 512MB of RAM, and a 6-inch E Ink Carta screen with 300 ppi and a frontlight with adjustable color temperature. Plus it weighs the same down to the gram, so it’s fairly obvious that the Tolino Shine 3 is in fact a clone of the Kobo Clara HD. Kobo is partnered with the Tolino Alliance so it’s not surprising to see a crossover device, and it’s not the first time it’s happened. While the hardware is the same, the software is completely different. In fact several years back it was possible to run Tolino’s Android software on Kobo ereaders. There was even a dual-boot hack that enabled you to run the software from a memory card so you could use both operating systems on a single ereader. With a lightweight, trimmed-down design and a high-resolution E Ink screen with adjustable color temperature, the Kobo Clara HD is a nice ereader to clone, provided they fixed the light bleed issue. I don’t usually cover Tolino’s ereaders much because they aren’t solid in North America at all, but it’s interesting to see another Kobo Clara HD on the market with a different name and operating system. I had the entry-level Tolino Page, which had a great OS that I became attached to, but the cheap plastic housing was such a joke that I find it hard to believe they are able to still sell them without a class action law suit. I had TWO of them before I gave up completely on it. I used a Tolino (3 HD) for 6 months. I liked at the beginning the reader, but then it became slow… incredibly slow. I installed everything from zero for two times , but nothing changed. The Kindle Paperwhite and the Oasis 2 were flying comparing to the Tolino. Here in Germany it is pretty hard to find a Tolino 3HD. You can find all the other models anyway. Maybe with them it will work better.